This picture was taken from a slide. So the quality is rather poor. I wonder if any Australian reader recognizes this beach? 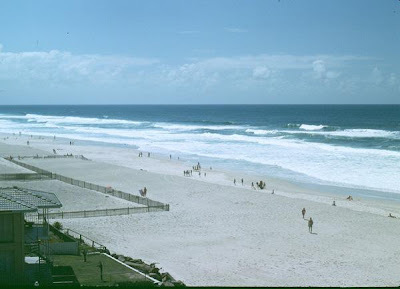 Well, it is Surfers Paradise in 1975! Our girls have been there two years ago and they told us it had become a little crowded. For more SkyWatch pictures click here or on the button in the side bar. For more My World pictures click here or on the button in the side bar. What a nice change from the winter weather. Beautiful beach. Love to visit there one day. Toch niks mooier dan blauwe luchten, strand en water. Schitterend. That's quiet a while ago, lol ! Now everywhere it's crowded ! Snapshots from the 60's & 70's had their own specific colors - they look cool today. Lovely photo. Can't stand crowded beaches. This one looks just fine, though. Now, where's my time machine?! Happy Tuesday from Italy. What a marvelous beach and what a great shot! Would love to be there right now! Have a great week! I went to Surfers in 1962 and have not been back since. I mind notice a bit of a change do you think? Should take another trip up there real soon while I can still manage it!! I was there about that time but don't recall the fences on the beach, but its a long beach, have returned several times, not its a concrete jungle with sky scrappers everywhere, but everyone still loves the place, it is the place to party it seems. Great beach that hasn't changed much. Mooie beelden, zowel Ijsland als Australië hebben we nog niet bezocht, maar staan op ons 'lijstje'.